Andante, ex-PMU, casts a giant shadow. In some ways, Dressage is a very elite sport. It is a wonderful thing to see an FEI horse competing in his prime- the best training on an impeccably bred Warmblood, guided by a talented rider, and brought along with all the advantages. What a beautiful post! I loved reading it this morning. I refer to basic dressage as “calisthenics,” like yoga or pilates for horses… it is a building block to any type of ride. I use it as a means to an end, not about perfecting the move necessarily, but improving the balance and our communication as partners. It’s the components of the dance, and it always about The Try! Great comment, we are on the same team! When I started my Dressage journey my Trainer gave us an evaluation lesson, and after watching us walk and trot for quite a while said these magic words: “She (referring to the horse) will do just fine, can’t see any reason why this horse will not be able to do it all.” Did she not see this was 15hh Paint mare ridden by a too long-limbed rider? Nope, she saw a sound horse that seemingly enjoyed the companionship of its rider, a rider that was willing to learn and train, and a relationship of pure magic. That is what Dressage takes. I thank you for the reminder. Yes, yes, yes!! Good trainer! Thank you so much for this article…it is spot on!! going to share it on FB for equestrian friends especially those who don’t think dressage is necessary for a jumper!! Oh, yes. It helps the flying horses too. Thanks. Yes, yes, yes! Give all the good guys a standing ovation! You know, the Spanish Riding School in Vienna named the institution well. The exquisite dressage moves are based on the long tradition in Spain of breeding and training equally exquisite horses, none of which had the height nor the leg length of today’s Warmblood. Their training techniques when transplanted to the New World with the conquistadors have flourished in the vaquero, gaucho, and llanero cultures. In this training philosophy, young horses are never started before a full 3 years of age, and their “horsenalities” are carefully observed in order to mold a training method best suited for them. Slow and gentle, quiet and patient are the keys to building a “finished” horse “in bit”. Fortunately, for us and our horses, sometimes, the “so old” becomes new again. Thank you, Anna, for following that great training tradition of looking past the outer appearance of both horse and rider. You see the potential within both of them and patiently call it forth. Thank you! We see that in rescue horses, the early years matter. You are MY kind of person! I would have absconded with the kitten too. My horses were rescued from a bad rescue…a STB formerly with the Amish and injured in a buggy accident, and an OTTB mare who I am trying to bond with, through dressage. I love your words…! Amen. 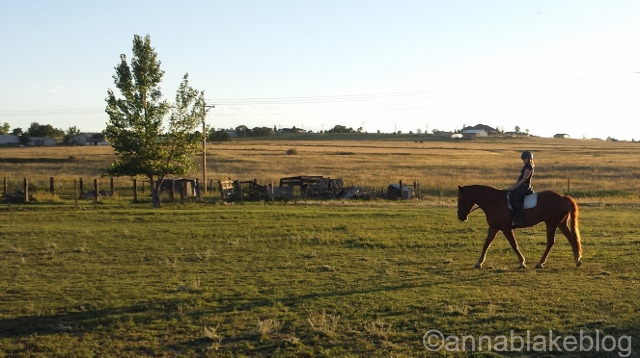 I love my 22 year old off the track – raced until he was 9, creaky thoroughbred. We started dressage lessons last fall and he is just wonderful. Miracle cure, so good for the old ones. It’s more about the journey than the destination. If your only goal in Dressage is winning ribbons, you’re going to miss a lot of the scenery along the way. As I read your post, I kept reading faster and faster, thinking to myself — this is ME!! I also took a pet store kitten in my early adult years and she also died the same night. I always felt like she at least had a sliver of love before she passed over the Rainbow Bridge. I also have a rescue horse — a Standardbred who moves about as quirky and stiff as they come! He is 23 now, and I have had him for 16 years. I cannot say enough about the very tender relationship we have with one another. He has my back, I have (on) his, and the dressage we have worked on over the years has made all the difference. I seem to be hearing (privately as well) so many dying kitten stories. Wow, to think of all those tiny lives lost makes me sad now. and yes, Dressage is the thing that builds strength, more kinds that the obvious. Thanks for your comment. My Sonny was an ex-racehorse. Finding a dressage instructor who understood him helped me as much as it helped him. She specialized in tough, hard-luck cases, equine and human. Thank you for reminding me about my friend – Sue, I miss you very much. Thanks for this heartfelt acknowledgement. There are enough trainer horror stories out there, I love hearing people give the nod to a good trainer! Absolutely wonderful post! I wish more trainers and horse people in general held your same outlook. Thank you for sharing your perspective. A good friend of mine cross trains her team roping horses in dressage (she used to compete nationally at Prix St. George level before switching disciplines). 90% of her training rides are dressage. Her chunky, older, hinky, AQHA horses are soft and supple, dreams to ride, and she has yet to miss a year of qualifying for the nationals in team roping. Over the years, I’ve had the pleasure of riding six of her horses from off-the-trailer start to polish. Stiff and balky goes to soft, supple and excited much more quickly than I thought possible. I have no aspirations to show dressage, but it’s still my top choice of learning and riding! For me, it’s a blueprint of how to train and ride as well as possible. Thank you so much for a lovely post. My two horses were rescued from slaughter, but as my trainer says, just because they were rescued once does not label them forever! I agree that people are missing huge opportunities when only looking for warmbloods for dressage. I hope that things change in this area in future! Wonderful, I’m with you, would love to see more of it. But you put a smile on my face today, thanks! WooHoo, good for you! Best of luck this season!